Bottled up in last week’s rain-soaked loss to Indiana, the Virginia football offense broke out in a major way in the first half of Saturday’s non-conference tilt versus preseason MAC favorite Ohio. 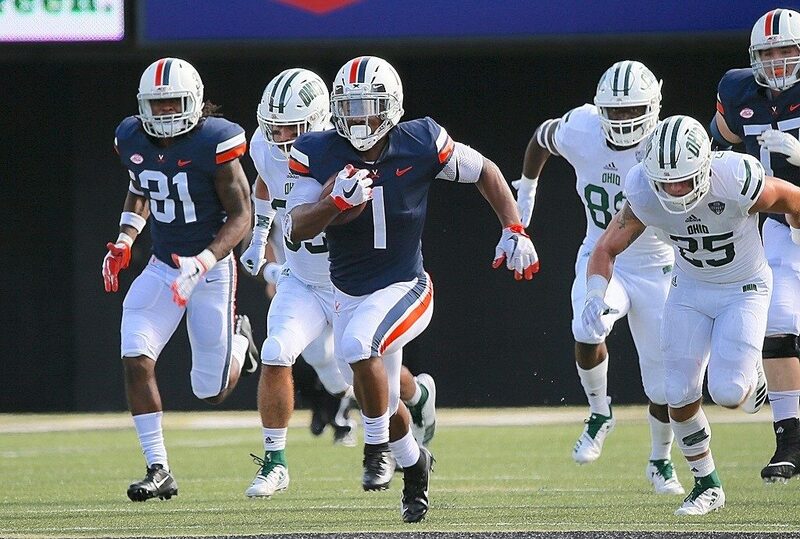 Senior running back Jordan Ellis accounted for three touchdowns while junior quarterback Bryce Perkins connected with wide receivers Olamide Zaccheaus and Hasise Dubois for two more, spurring the Hoos on to a 38-point first-half offensive eruption. Virginia led by 17 at halftime and held on to defeat the Bobcats, 45-31, at Vanderbilt Stadium in Nashville, Tennessee. Previously scheduled to take place in Scott Stadium in Charlottesville, the game was moved to Nashville out of concern for Hurricane Florence. Virginia third-year head coach Bronco Mendenhall was grateful to play the game at all. Mendenhall could hardly have scripted a better start. Junior defensive tackle Eli Hanback recovered Ohio quarterback Nathan Rourke’s fumble on the game’s third play. UVA capitalized on the very next play, when Ellis took a Perkins handoff straight up the middle for an 18-yard touchdown run. On the Cavaliers very next offensive play, Perkins hit Zaccheaus for an 86-yard touchdown reception. Two minutes and nine seconds into the game, Virginia led 14-0. Ohio countered with a touchdown drive of its own to cut the deficit to seven before Ellis busted another up-the-middle run, this time going 75 yards for a touchdown and giving the Hoos a 21-7 first quarter lead. Six offensive plays, three touchdowns for the Hoos. While the Virginia defense held the Bobcat offense in check, the Cavalier offense added two more touchdowns – a 6-yard run from Ellis and 10-yard pass from Perkins to Dubois – to boost the lead to 35-7. Just when the rout seemed to be on, however, a couple of Cavalier miscues opened the door for head coach Frank Solich’s team, who took advantage. Ohio turned a Perkins turnover and a recovered onside kick into touchdowns to cut Virginia’s lead to 14 points with less than a minute to go in the first half. The Hoos took a 38-21 lead into halftime thanks to a 6-play, 60-yard drive that resulted in a 32-yard field goal by A.J. Mejia, but Ohio countered early in the third quarter with a 6-play, 80-yard touchdown drive to close to within 10. While its offense struggled to get back the magic of its first half performance, Virginia relied on its defense to pick up the slack. The unit came up big, holding Ohio scoreless for three straight possessions following the early third quarter touchdown. The first of those three Bobcat possessions made it to the Virginia 40 yard-line before junior cornerback Bryce Hall broke up a Rourke pass on 4th and 3. With 6:16 remaining in the game and Virginia facing a 3rd-and-4 from its 23 yard-line, Zaccheaus stepped up to give the Cavaliers some breathing room. The speedy senior leader corralled Perkins’ pass at around the UVA 31, raced by two Ohio defenders, avoided a third, and sprinted to the end zone for a 77-yard touchdown that put Virginia up 45-28, effectively sealing victory for the Cavaliers. The clutch 4th-quarter score capped off a huge day for Zaccheaus, who finished with nine catches for a single season school record 247 receiving yards and two touchdowns. A resilient effort from the senior, who had only nine yards total and had a key drop in the Indiana loss. Virginia racked up 552 yards of offense in total against Ohio, approaching almost 400 yards through the air and accumulating 173 yards rushing. Perkins displayed on-point passing much of the game, finishing with 25 completions in 30 attempts for 379 yards and three touchdowns. Four Cavalier receivers had at least four catches in this game, but Zaccheaus and Dubois were the go-to-targets. Dubois, a junior, finished with six receptions for 69 yards and a touchdown. Ellis led the way on the ground with 19 carries for 171 yards and three scores. Perkins, who had rushed for over 100 yards in each of his first two games as a Cavalier, was held to just 8 yards on 10 carries. He was sacked three times. Virginia’s defense surrendered 364 total yards, including 246 yards passing and two touchdowns from Rourke, but forced two fumbles lost, both of which were recovered by Hanback. The standout junior had a golden opportunity to score a touchdown on the second recovery, but he lost control of the ball and Ohio recovered at its own 1. Sophomore inside linebacker Zane Zandier led UVA in tackles with 10. He had 1.5 sacks on the day. As did senior outside linebacker Chris Peace, who forced Rourke’s first fumble of the game. Virginia (2-1) returns to action next Saturday, September 22, at 12:30 p.m. in Scott Stadium. Louisville comes to Charlottesville for what will be the Cavaliers’ first Atlantic Coast Conference game of the season.